Ferdinand Thun was a quintessential partner. He was a partner in an extraordinary number of extraordinary enterprises and for an extraordinary length of time. 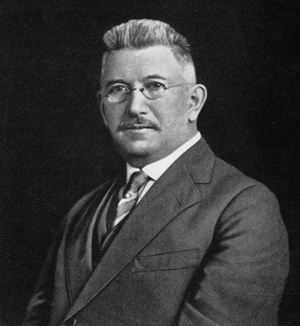 It all began in 1892 when he formed a partnership with Henry Janssen, encouraging him to come to Reading, Pennsylvania, and start a braiding machine company. This growing business moved to Wyomissing as the Textile Machine Works in 1896 and began blossoming into three world-class industries. By 1900 the partners had begun using their own braiding machines and then incorporated the Narrow Fabric Company to sell a large variety of braids. By 1906 the Textile Machine Works had started making knitting machines for women’s full-fashioned stockings and was on the way to becoming the major manufacturer of these machines in the American market and achieving world outreach as well. With their own knitting machines, the partners then began making full-fashioned stockings and in 1906 incorporated the Berkshire Knitting Mills, a company destined to become the largest of its kind in the world. Making these three companies – known together as the Wyomissing Industries – not only possible but also so hugely successful was the combined business genius of Ferdinand Thun and the mechanical genius of Henry Janssen, partners from 1892 until 1948, an amazing span of 56 years. The two men were both born in the same industrial city of Barmen, Germany, within six days and within a half mile of each other in February 1866. Never meeting in Germany, the two men became friends in 1889 in New York, where they were working for two different braiding companies. To enhance both the industry and the borough, Ferdinand Thun and his partners also initiated the Wyomissing Building and Savings Association in 1902 and later the People’s Trust Company to support financial services for resident workers and others. They also created the Wyomissing Development Company and the Delta Realty Company to build hundreds of homes in Wyomissing and abutting West Reading and the 18th Ward in Reading. Even philanthropy was a joint venture as Thun and Janssen, along with Gustav Oberlaender, whom they had taken on as a partner to run the Berkshire Knitting Mills, pooled their resources from 1926 to 1935 to establish The Wyomissing Foundation. Together they donated land and substantial sums to build the Reading Hospital and the Reading Public Museum. 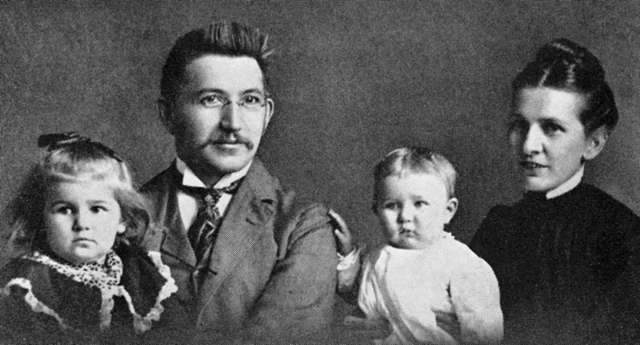 In Thun’s personal life, his best friend and partner was his wife of 52 years, Anna Marie Grebe, whom he married in 1896. She nurtured their loving family of four girls and twin boys and supported her husband’s community spirit by giving the Wyomissing Public Library. Friendship was an important strength of Thun’s, as one might infer from his large number of collaborative relationships in his American business and community worlds. He kept in touch with boyhood friends and his relatives back in Barmen and made new friends during his many visits to Germany. A partner and then owner of the Ontelaunee Orchards, Thun loved to send boxes of apples to his friends and relatives from this business-hobby of his. As a German-American, Ferdinand Thun, devoted as he was to creating a model industrial complex and a model residential community in America, never forgot his native roots. After both World War I and II, he arranged to send money, food and medical supplies to the suffering Germans. Feeling passionately about the differing strengths of the American and the German cultures and the possibility of the two nations learning from each other, in 1928 Thun initiated the Carl Schurz Memorial Foundation to create cultural exchanges between Americans and Germans and to promote mutual understanding and friendship. Ferdinand Thun and his partners created opportunities and excellent working conditions for workers from all over Berks County – in 1936 there were over 9,000 employees at the Wyomissing Industries – and he and his partners created an ideal residential community for thousands of children and adults, all through sustained hard work, sound judgment, collaborative spirit and generosity. Since Thun’s death in 1949, The Wyomissing Foundation has been honoring his legacy by its outreach to and partnership with important community programs.